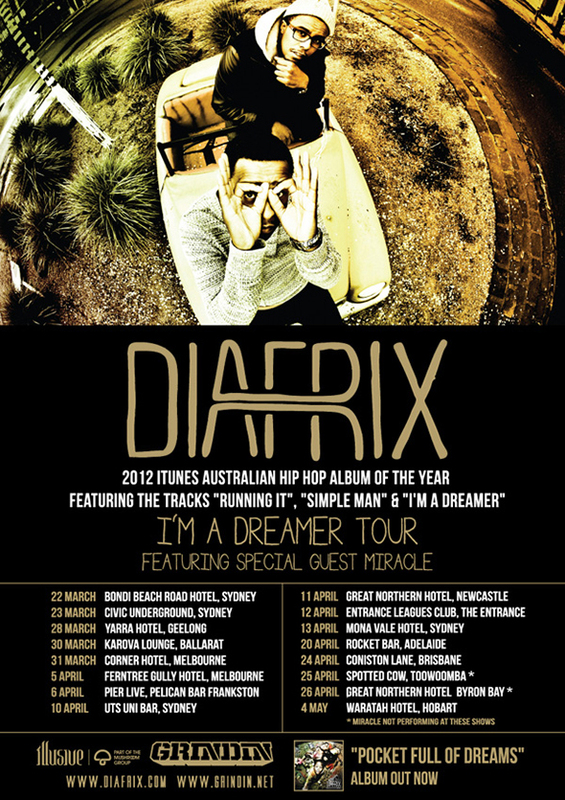 Fresh off supporting Macklemore and Ryan Lewis on their sold-out tour of Australia, Melbourne duo Diafrix proudly announce I’m A Dreamer Tour which sees them performing across Australia featuring special guest, emerging Sydney based rapper Miracle. In 2012, Diafrix returned with their new album Pocket Full Of Dreams, with special guest appearances from 360, Dwele and Daniel Merriweather and the majority of the production helmed by Styalz Fuego, the ARIA Award winning producer behind 360′s double platinum Falling & Flying LP. The album saw rave reviews and was named iTunes Best Australian Hip-Hop Release of 2012. The band featured prominently at the Queenscliff Music Festival, Homebake Festival and Rainbow Serpent as the singles Running It, Easy Come, Easy Go and I’m A Dreamer featuring 360 found extensive national radio support from triple j and Nova. Catch Diafrix on tour this coming March, April and May.